Across Central and South America, conservationists, teachers, and researchers are benefiting from groups like Birder’s Exchange, a program of the American Birding Association. The program collects new and used binoculars, scopes, books, and tripods, and passes them on to people working to conserve birds and their habitats. Supporting this program is a win-win-win. You clear a space in your closet. The local naturalists and educators are better equipped to do their work. 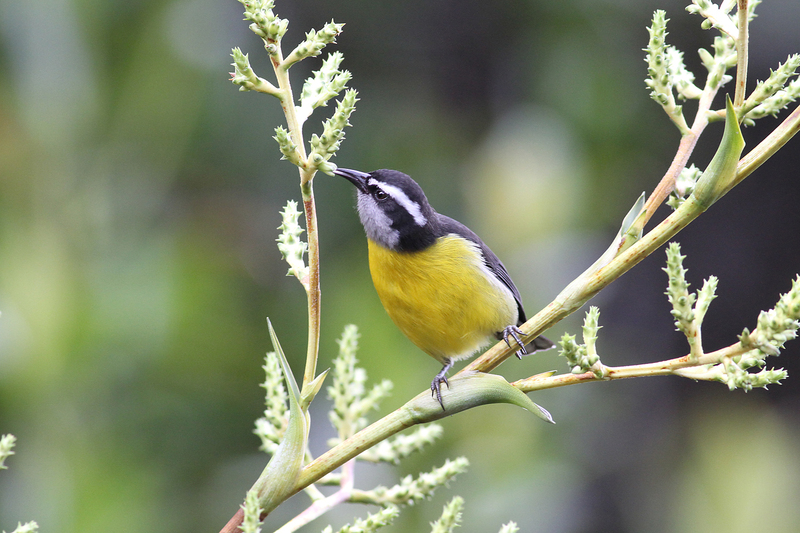 And the birds (including this Bananaquit) win, when communities value the habitat birds depend on. What to Do with Those Old Binoculars? A lot of birds are, well, small. Like the Bananaquit – a lively little honeycreeper, a bit bigger than a hummingbird, that’s found across parts of Central and South America. Studying them online or in books and field guides is a good start, but seeing them in the wild? -- It’s there where they really come alive. And that means you need binoculars or a spotting scope. Across Central and South America, conservationists, teachers, and researchers are benefiting from organizations like Birder’s Exchange, a program of the American Birding Association. The program collects donations of new and used binoculars, scopes, books, and tripods, and passes them on to people who are working to conserve birds and their habitats. Finding a new home for those binoculars is a win-win-win. You clear that space in your closet and know that your donation is really doing some good. The local naturalists and educators are better equipped to find work in the growing ecotourism industry. And the birds win, when communities begin to value the habitat and the diversity that they depend on. And that means more land will stay natural and wild and not be cleared for farms and ranches. Learn how you can donate your binoculars. Begin at BirdNoteorg. Today's show brought to you by the Bobolink Foundation. For Birdnote, I’m Mary McCann. Bird sounds provided by The Macaulay Library of Natural Sounds at the Cornell Lab of Ornithology, Ithaca, New York. 126698 recorded by Curtis A. Marantz. 168301 recorded by Wilbur L Hershberger. 176224 recorded by Geoffrey A Keller.